Last week I hopped on a train to spend a couple days with my daughter. It's rare to have that time with her so I didn't hesitate to accept the invitation. While I was getting a few things packed my mind was on whether I should take my computer, my iPad or just my phone. Which device would give me the most options to keep my mind occupied and allow me to stay connected to email, messaging, Facebook and Twitter. We're not talking about business interactions here- or work per se. Pure distraction. The computer won out until the last moment when I realized that along with everything else it would be too heavy to lug while walking the blocks to get to her place. I begrudgingly switched it for my iPad. No DVD's and the wifi on the train is not the best for streaming, so no videos. Damn. As I was setting up on the train, impatiently waiting for the wifi to kick in, my mind was far from the present. And when it did connect I couldn't wait to check the boxes of all the ways I could put in the time. This went on for about 45 minutes, until I happened to glance up and see the most beautiful church steeple reaching up into the blue sky. And it hit me. I'm going to miss this beautiful fall day as we make our way through the countryside. What a shame it would be, to have my head buried in my iPad, checking my newsfeed while the real magic was happening right outside my window. I closed my iPad. I breathed in the life around me. A flock of seagulls taking flight from a farmer's field, countless round bales of hay dotting the freshly mown pasture. A clothesline strung with sheets flapping in the breeze. a single donkey chewing contently totally unaware and uncaring of the monster roaring past him. I rested my eyes and mind for awhile, and let the gentle swaying of the train lull me into a comforting, peaceful repose. What I will remember about that little trip was not about how many likes I got on a post, or unimportant emails, or videos I tried to stream. Those things are like sound bites, with no lasting content. Life outside that window is what I'll remember. And treasure. Last weekend my husband and I celebrated our 39th wedding anniversary. I have to admit, I haven't really paid attention to the number during the last few years- it was '30 something' in my brain. So when I realized it was 39 this year, it stopped me in my tracks. Literally. Something about that number made me rewind all those years, back to that wonderful day in 1977. Almost four decades together, I recalled some of the highlights, both joyful and sad. If you've been married this many years, you experience a lot together. I also felt something else this year, something unfamiliar until now. But the truth of it is, life does move quickly, and I swear even faster with each passing year. My mother-in-law said that when she turned 90 (and that's a lot of years) that it didn't seem possible that her life contained so many years, and yet still felt so brief. The important part of all of this is that it is wake up call- a poignant reminder that our moments really are precious- and fleeting. That it's worth pausing during the day- as often as we can- just to appreciate our abundant blessings, and the lessons we're still learning. To embrace these moments. We can't hold on to time, but we can learn to slow down long enough to breathe life in, and give thanks. One of the gifts of yoga is to take that time to be with ourselves on the mat. To set our busy life down for a bit, to come home to ourselves, and honour our bodies- and our lives, no matter what they look or feel like. To accept what is- and to humbly, compassionately give thanks for this life we've been given. If we can practise this, on and off the mat, life may continue to move quickly, but I have a hunch that 'from this day forward' maybe the quantity of years won't be quite as important as the quality. But last night as I was lying in bed, I began reviewing the day, and to my surprise I noticed how many sweet things also happened. Like my husband taking a very busy work day to be with me, the kind messages that our girls, my sisters and good friends sent to wish me well. The second warm blanket the nurse gave me to keep me warm and the way the doctor held my hand until I was asleep. The way my little cat sensed I wasn't well as she quietly waited on the chair outside our bedroom for me. The taste of buttery toast in my mouth when I felt better. And the sense of relief that everything went well. 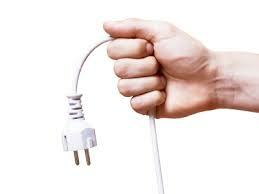 For some reason, our minds seem to be hard wired to latch on to the unpleasant things. It takes practice to notice the good stuff. And there's always good stuff. It doesn't mean that we can't or shouldn't acknowledge life's challenges. Because we all know that that is part of life as well. And they make the sweet things in life even sweeter. I like the phrase 'and this too' because it acknowledges an openness to include life in all of its fullness. And yes, it takes practice to remind ourselves that amidst the challenges, are nuggets of gold. Sometimes we have to look harder for them, but they're always there. 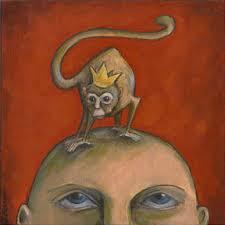 There is an Buddhist expression in meditation called the 'monkey mind'. It describes the jumping around of the mind, unsettled and restless, pausing briefly on a thought that pops up before moving onto the next. Imagine a monkey swinging from branch to branch, back and forth in constant motion. You get the picture. Monkey minds are often in an agitated states too, dreading something that may happen in the future or fixating on something that happened in the past. I can relate. I can be quite the worrier at times. My monkey mind likes to jump ahead, imagining different scenarios, making assumptions that don't yet exist (that often turn out wrong anyway) ), worrying about 'what if'. Granted some mental preparation is often useful in planning ahead, but when it becomes rumination- well that's something else.. and it rarely serves me well. However, when I started a regular meditation and yoga practice, I began to learn that the monkey mind can be gently trained. When we are in a pose (asana) we train the mind to be focused on what your body is doing. It takes time to transition into the pose thoughtfully, to tune into our bodies in an intimate way. Pranayama (controlling the breath) can work in a similar way. When all our attention is focused on our breath, there is no room for background chatter. Instead the mind is invited to rest on the simple act of breathing in… and breathing out. Together they work in harmony to calm the mind, and to settle some of our monkey mind chatter. We're given the gift of quiet awareness- the gift of coming home. Home to that peaceful heart that resides in us all. Christmas is a bit of a yin/yang time for me. As much as I dislike all the commercial hype around it, I do love the family time and all the traditions, both old and new that are uniquely ours. I also love anything natural at this time. I keep my bird feeders full and I so appreciate their beautiful presence throughout the winter months. Even though we don't have one (because of a certain furry family member) I do love real Christmas trees, and the greens that I pick out for my outdoor pot each year. I love the poinsettias, the way my Christmas cactus seems to know when it's time to bloom. 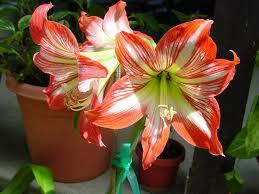 And I especially love the amaryllis plant. There is something so simple, yet so magical about planting this bulb in a pot of soil, and watching it push through the earth – the slim and waxy leaves, the thick stalk with that plump bulb perched on top, day by day reaching for the sky. And finally announcing its grand entrance as it bursts open into not just one but multiple exquisite blooms! Amaryllis' are not shy. They bloom like they are the only flower that ever mattered! And unlike the lovely hibiscus flower that only lives a day, the amaryllis hold it's bloom for many days, blessing us over and over again with intoxicating beauty. This special flower has symbolism attached to it as well. It's a living symbol of love, and ethereal beauty. It also symbolizes strength and determination to continue in the face of life's challenges. To me it is also about how nature reveals the mystery of life through this plant. We plant a seed within us, nurture it to keep it alive, and then we have the faith that something will grow. It really is not in our hands but we tend it carefully and tenderly and with patience. And when we're least expecting it grace touches down and something blooms within us, awakening us to a deeper sense of life itself. For several years I gave my dear mom an amaryllis and I delighted in her joy as the first bloom emerged. And in that spirit of joy I will keep this tradition alive by offering it to other loved ones this holiday season. May you also find joy in whatever touches you this, and let your heart be as beautiful as the amaryllis boom. 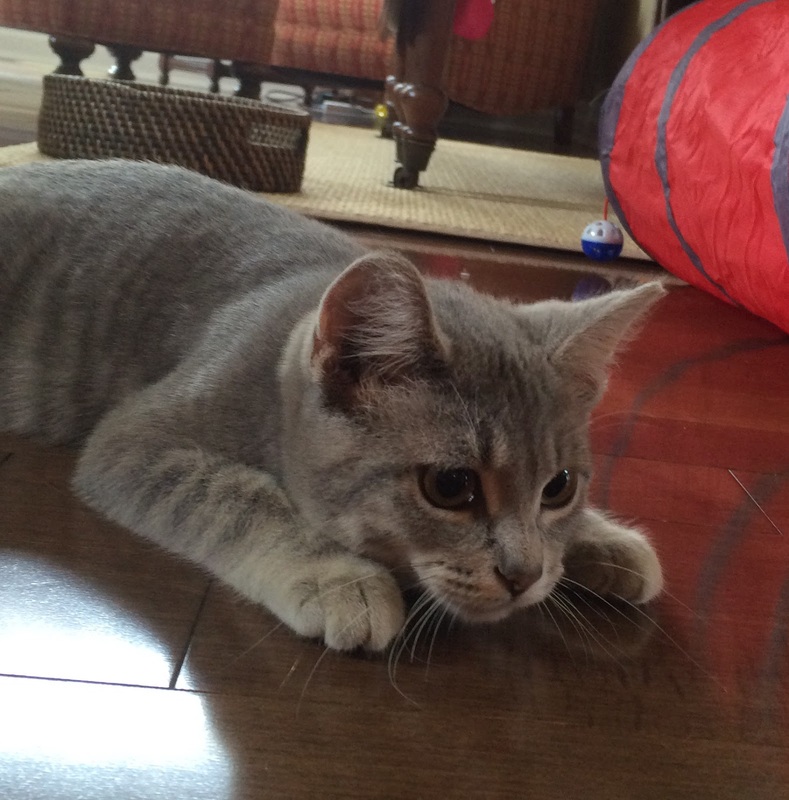 A week ago I walked into a pet store and walked out with a silver tabby kitten. I knew she had me as soon as the cage opened, and she nuzzled into my neck, purring loudly. We had found each other. Mimi has breathed new life into our home and my heart is so full of love for this sweet little soul. And already she is teaching me some lessons to take on and off the mat. Here are just a few. Be Curious. A kitten is full of curiosity! The simplest things are full of intrigue, and she is constantly wondering, exploring, checking things out. Eyes wide and questioning, her world is there to discover. I can relate. I've always been curious but sometimes I need reminders to look at life through this lens a little more often. No matter how old we are, to have a curious, fresh mind opens the doors to new opportunity, new possibilities in life. It's exciting and rejuvenating to be inquisitive, even with the simplest things. To meet life with a beginner's mind, open and ready to learn more. And it keeps us young as a kitten! Be Playful. I love the way that kittens are completely spontaneous and eager to play at the slightest suggestion. Pretending her furry mouse is real, she tackles it fiercely and carries it to her little bed. Or leaps off the furniture in pursuit of that feather bird. The exuberance of her playful nature brings out the same in me. How long has it been since I sat on the floor and just played with a kitten? Too long. It lightens the heart like nothing else. It also reminds me how important play is and how easily we can forget it amidst the seriousness of our lives. I really think we'd be healthier, happier human beings if we found time to have silly stupid fun. So get out there and play! Take Naps. I always have to laugh when Mimi plays full out, and then flops. Curled up in a ball or sprawled out on the floor, she's dead to the world for her cat nap. And when she wakes, she's refreshed and ready to go. How often do we take naps when we're tired, even when we're home and have the luxury of doing so? There have been many studies showing the importance of naps to one's health, but still few of us feel like we have permission to lie down for a half an hour to catch a few winks. Napping is so restorative, and much healthier than that extra cup of coffee to keep us going throughout out the day. So consider a little nap when you can, and know it's time well spent. Trust. From the first time I scooped her up into my arms, this kitten has entrusted me with her life. To feed her, keep her safe and well, to give her kindness and love- to be there when she needs me. It's as simple as that. It's a humbling reminder of the importance of trusting in life. To know we'll be given what we need, that even in the hard times we'll be taken care of, and that all will be well. Trusting opens the heart to receiving.. and to giving back. All these lessons in just one week. I can't wait to learn more as we grow together..
We left for Italy at the end of September. Before boarding (yoga mat in tow, healthy food and running gear), I announced to my husband "I'm sticking with my routine while we're away- eating healthy, running and practising yoga!" With absolute conviction in my voice I think he actually believed it a little. He just smiled and said "We'll do our best." I think it was approximately 20 minutes from the Italian airport, on the way to our destination when we pulled over at a rest stop for our first espresso and chocolate croissant. And from there, you can pretty well guess how the rest of the trip went. (It was the best). However when we arrived home and opened the door. I turned to my husband again and jokingly said "bootcamp begins NOW!" I had visions of us sliding back into our healthy routine without any interruptions or discomfort. A pretty good plan if it hadn't been for the stomach flu and jet lag. And the death of my one of the most important people in my life. So when I finally laced up my running shoes and opened the door on a cool clear morning, I left without expectations of anything. I headed out to the wooded path, where nature reaches out and pulls me close to her. A place where I can exhale, and fall into her arms. 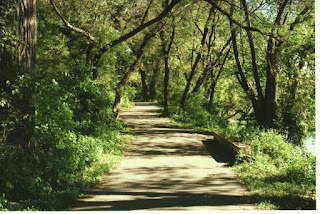 As I was running along the secluded trail something happened that often happens when I leave my expectations and intentions at the door. My head gets clearer, my mind quieter, my heart lighter. The rules about my life fade out, and all that matters is opening to something greater. I took the crisp air into my lungs, and noticed all the changes that had taken place in the vegetation since I had been there. It was noticeably fall and this transition comforted me. The sounds were different, and it smelled of golden rods and tiny purple asters. The world seemed right, the way it was meant to be. I often have little (and sometimes big) revelations as I run this quiet path. Today it was two simple words. Words that I've heard my daughter say many times. 'Just today'. Just today, enjoy and be grateful for more things than I can count, including the ability to run this path, for someday I will no longer be able to. Just today, enjoy that I can eat wholesome, healthy food- a bounty of it. And just today remember that it is a privilege to be able to look after this body that has worked so hard for me, and has served me so well for 60 years. As I finished my run, it didn't seem quite as important to do it all 'just right'. It was enough to simply make the first step and know the rest would follow. I turned and looked back at that path as I headed home. Thank you, I said quietly. For today. Just today.